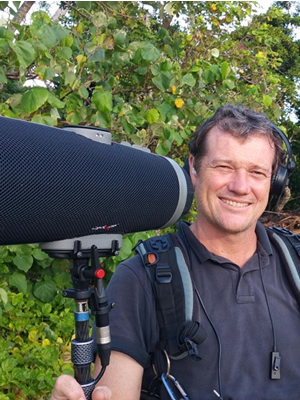 Andrew has been a Location Sound Recordist since 1985. He has worked extensively across television documentaries, reality series, Infotainment shows and corporate videos including a feature film. Certified at the School Of Audio Engineering (SAE Institute), and working out of Sydney for 26 years with many overseas shoots, Andrew re-located to Brisbane Gold Coast areas from 2011. He has a reputation for reliable audio, working quickly under pressure, easy to work with, and helping with gear. Andrew Came onto our team for a four day shoot and he was cool as a cucumber the whole time and brought a positive feel to the days. After reviewing his work later it was a pleasure to find clear, well balanced and all round great Sound files and syncs.